Half term last week already seems like a distant memory. One dry and bright day, the Blondies and I decided to catch the bus into town. I thought it would be a bit more fun than driving and parking. £11!!! We only live about 2 miles away from the city centre. I used to be able to catch the bus for 32p return. And, no, that's not old money! Honestly, no wonder people are reluctant to use public transport. It just so happens that we alighted right outside Primark so we popped in for a browse. 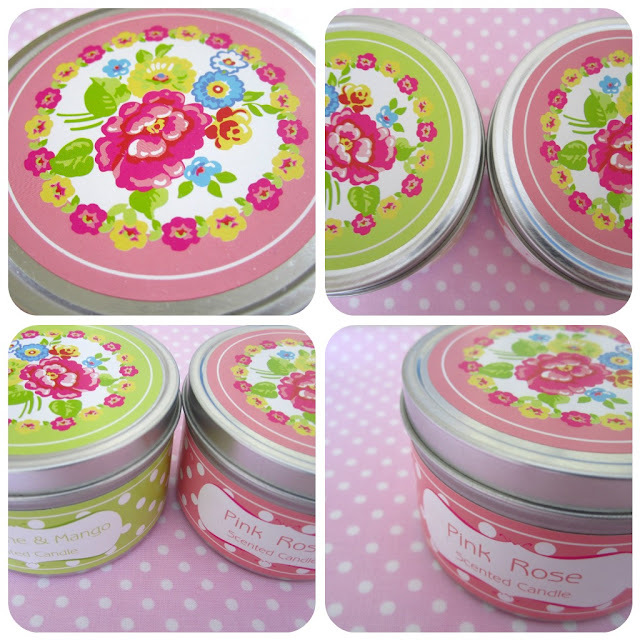 Candles for £1.50 each. Aren't the tins gorgeous? They smell lovely too. Oh I do love a little shopping spree. D and I celebrated our 14th wedding anniversary on Valentines' Day. I cooked D's favourite supper (pasta with smoked salmon in garlic, cream and white wine liberally scattered with toasted pine nuts) and he supplied the bottle of Sancerre and flowers. We sat cuddled up on the sofa afterwards and reminisced our way through our wedding photos. I absolutely love this time of year. Spring is lurking just around the corner. I so want to throw open the windows and watch pretty bedding flapping on the washing line. The crochet you may have glimpsed in my last post is progressing slowly. It's another cushion cover; this time a rectangle just over twice the length of my cushion which will fasten envelope style. Well, that's the plan. I'm having a love affair with double crochet (US single) at the moment and always adore these Sublime Cashmere Merino colours. Have a lovely, colourful day. Flipping LUSH!!!!!! How much were those canvasses in Primark? I love them. Happy Anniversary to you both, 14 years! That's wonderful. Well don on winning the jug, how DO people get rid of such lush things? Lovely colours, making me feel all warm and sunny. 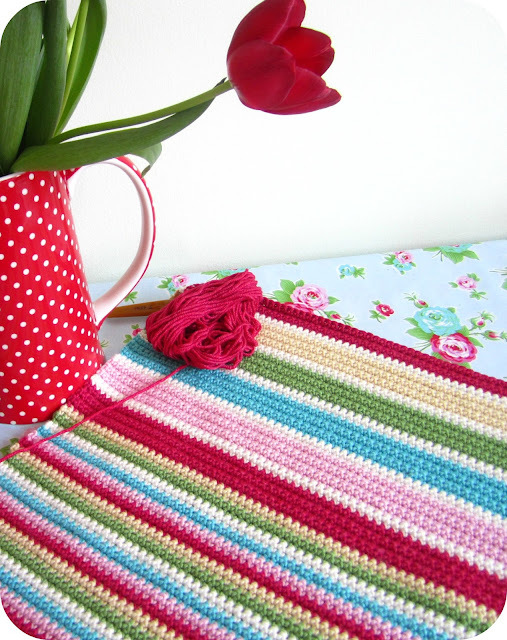 Great buys from Primark sweetie :) love your crocheting and the jug of tulips is just gorgeous! Happy Anniversary, love your flowers, jug and cushion cover!! I love the look of your blanket! I love your new purchases, all bright and airy and set for spring. Primark? Really truly? I never see anything nice in ours but then I do tend to rush in and out with a single focus. I shall have to explore, and there is a very good cupcake shop handily close to it. And I do think it's jolly unfair to show those glorious colours when I've just spent a small fortune (don't tell Mr DC) on Rowan Handknit cotton which is destined to go the same way as yours. Delicious. Oooooh such a yummy post! Firstly.....fab Greengate bargain find! I keep going back to primark. It's a big store but I think they no my name after the last couple of weeks. I'm such a sucker for pretty....and if it's cheap pretty, well i'm a gonner! Gorgeous crochet too. Lovely colour combo, will look awesome all finished and plumpy! The primark stuff is fabulous isn't it!!! love your purchases! Thank you for the sidebar mention! Mwah! Such joy to behold! A lovely cheerful post. Just what I needed after a relatively hectic day. Our half-term starts next week. Here in France there are three separate zones which are on holiday on staggered dates. We are last and I can assure you that since early January it has been a very long haul. Ho hum. I must stop rabbiting on. Have a lovely weekend. ps I don't know if you are aware or not I am having a giveaway. One of the gifts is from the French paper artist Miss Clara and it's really beautiful. I thought I should let you know. What a terrible price for the bus fare! No incentive for people to leave their cars at home. You got some great buys there - I love the pretty candles! 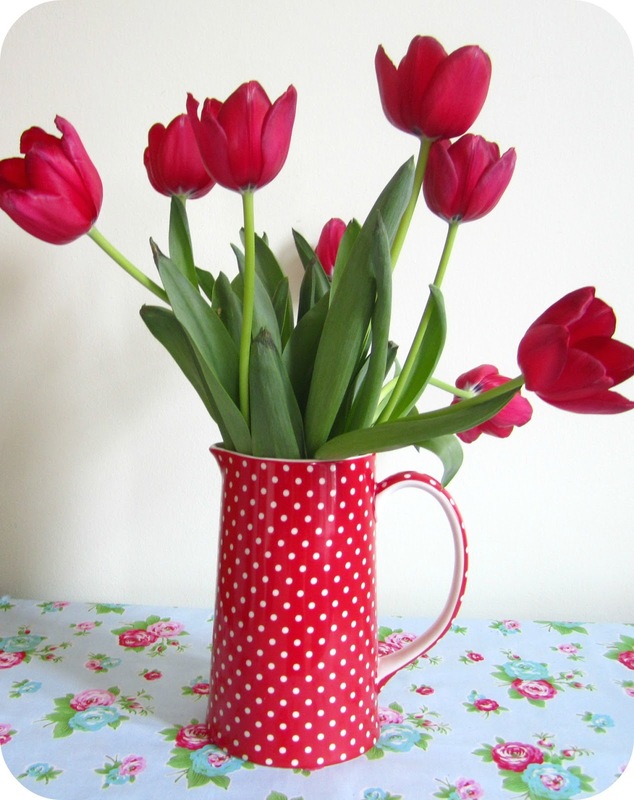 The Greengate jug looks lovely with the tulips - so springlike, and sounds like you got another bargain. Such a gorgeous cushion cover to round off a great post of lovely treats! Primark can serve up some winning stuff every now and then, can't it?! I can't believe anyone would not want that glorious jug! Lucky you. 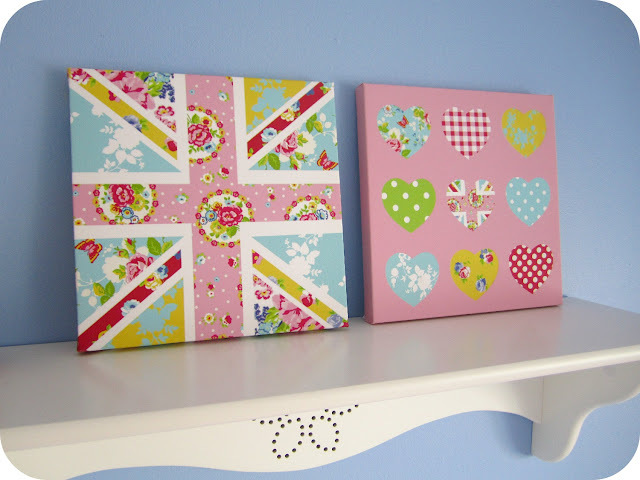 Unwanted Greengate? An oxymoron surely? How lucky you were. That jug is on my wish list. I love the table cloth and, of course, the crochet. Ahhhhhhhhh. 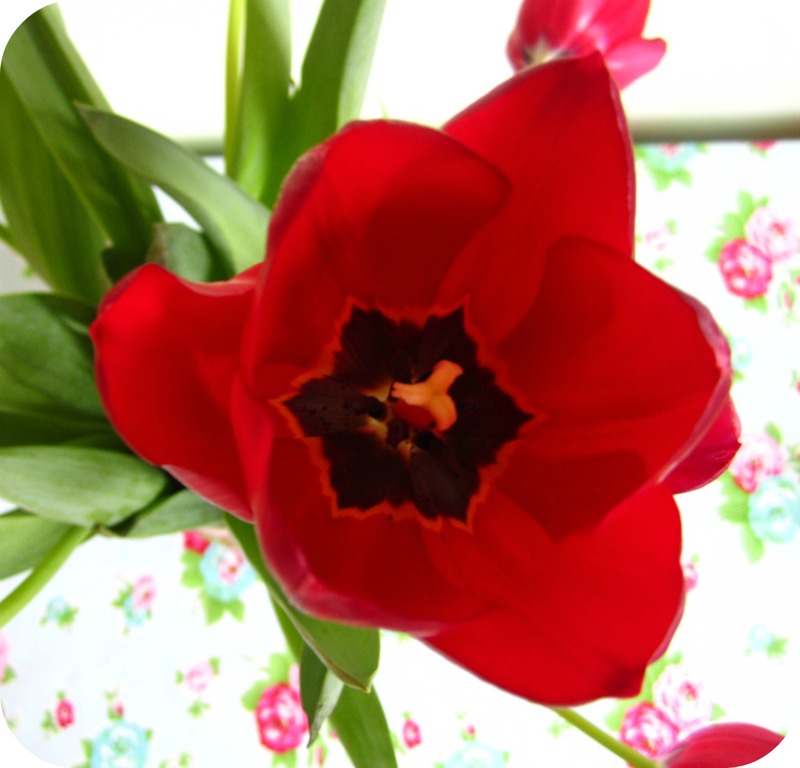 We are new bloggers and reallly enjoy the array of pinks in your photographs! The crochet is very fun. We have some crochet flowers that we've made into pins. They make cute decorations. Very lively post! what a beautiful site you have!! just happened upon it ... love your photos to bits!